Abstract: Acute megakaryocytic leukemia (M7-AML) is a rare form of acute myeloid leukemia (AML), which is associated with poor prognosis. The case presented in the current report is a statement for the difficult diagnosis and clinical management of M7-AML in the context of a previous hematologic disorder of undetermined significance and associated genetic abnormalities. Probably, following the complete hematologic remission and further with induction chemotherapy plus tyrosine kinase inhibitor therapy, the clinical management of this case will be followed by a allogeneic bone marrow transplantation, the only proven therapy to improve overall survival. Herein, we describe the clinical case of a 47-year-old male who was diagnosed in our clinic with M7-AML, which was associated with antecedent hematologic disorder of undetermined significance and two BCR–ABL transcripts. A 47-year-old gentleman presented at our clinic in September 2016 for asthenia, which lasted for the previous 4 weeks. The patient’s medical history was consistent with intermittent low-grade fever associated with bicytopenia (neutropenia and thrombocytopenia) for the last 3 years. The patient had no other comorbidities. A bone marrow aspirate was performed in 2013, which showed decreased myeloid series with 35% of granulocytic series and no other abnormalities. The virusologic (hepatitis B, C and HIV viruses) status was negative. The immunological assays were negative. There was no treatment given, and the patient was periodically seen every 3 months. The clinical examination showed a light pale, enlarged lymph nodes; splenomegaly at 6 cm under the costal rib and oral candidiasis. 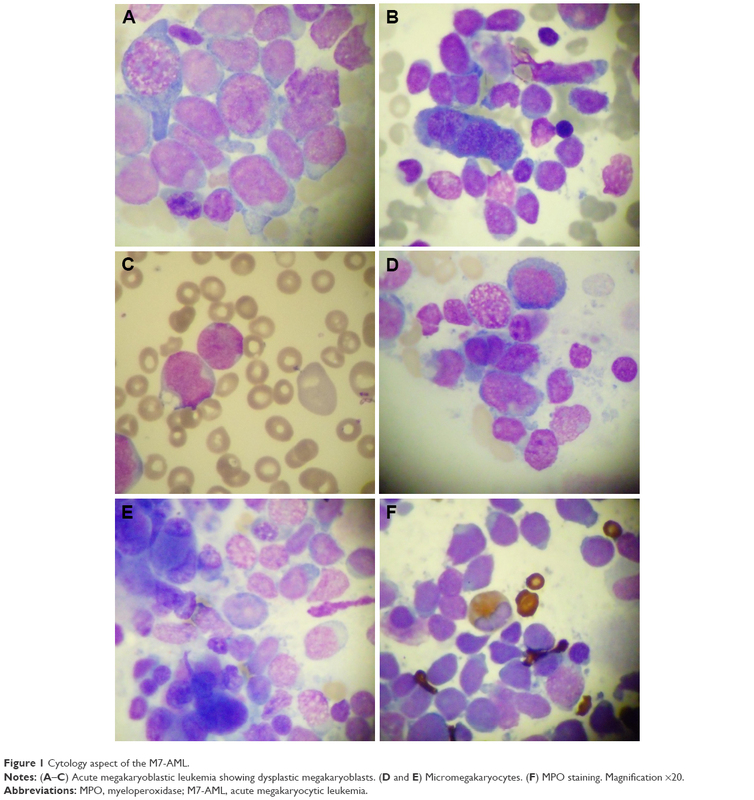 The hematologic examination revealed important leukocytosis at 120×103/μL with 80% blasts (Figure 1), moderate anemia (9 g/dL Hb) and moderate thrombocytopenia (45×103/μL) as well as schistocytes. Biochemical analyses showed increased LDH at 1,895 UI/L (normal range: 230–460 UI/L). Coagulation assays were normal. Figure 1 Cytology aspect of the M7-AML. Notes: (A–C) Acute megakaryoblastic leukemia showing dysplastic megakaryoblasts. (D and E) Micromegakaryocytes. (F) MPO staining. Magnification ×20. Abbreviations: MPO, myeloperoxidase; M7-AML, acute megakaryocytic leukemia. The first bone marrow aspirate was a dry tap. The second bone marrow aspirate was performed, which showed an 30% infiltrate of immature cells with megakaryocytic appearance, signs of dysplasia (micromegakaryocytes) and reduced myeloid series. The bone marrow biopsy revealed 90% infiltration of tumoral monomorphic cells with round nuclei with nucleoli and increased nucleus/cytoplasma ratio. Immunohistochemical staining showed malignant cells that were positive for CD34, CD117, CD61 and Ki-67. The cells were negative for MPO and glycophorin A. Mutational analysis revealed two BCR–ABL transcripts: p210 and p190, transcripts detected by quantitative polymerase chain reaction (qPCR). FLT3 ITD and NPM mutations were negative. HLA phenotype is pending for both the patient and his sister. Written informed consent for publication has been obtained from the patient, after all the details of presenting the case in international medical literature were presented and explained. Our patient is a middle-aged man with a history of bicytopenia. Retrospectively, the patient could be considered as suffering of cytopenia of undetermined significance. At presentation at our clinic, the patient complained of asthenia. There were enlarged adenopathies and splenomegaly. There was an important leukocytosis with anemia and thrombocytopenia. The first attempt for bone marrow aspirate failed, but the second aspirate revealed an infiltrate of megakaryoblasts that were negative at MPO staining. The immunohistochemistry performed on bone marrow biopsy showed that platelet antigens along with myeloid antigens were present on the leukemic cells. The mutational analysis showed two BCR–ABL transcripts. The patient was treated with induction chemotherapy with good initial response. The HLA phenotype is pending, and the patient will be referred to a transplantation unit as soon as possible. The case presented in the current report is a statement for the difficult diagnosis and clinical management of M7-AML in the context of a previous hematologic disorder of undetermined significance and associated genetic abnormalities. Probably, following the complete hematologic remission and further with induction chemotherapy plus tyrosine kinase inhibitor therapy, the clinical management of this case will be followed by a allogeneic bone marrow transplantation, the only proven therapy to improve overall survival. Cytopenias of undetermined significance of the presence of BCR–ABL transcripts have yet to be presented in AML, but in chronic myeloid leukemia (CML), this scenario could be associated with aggressive disease. Abnormal BCR–ABL transcripts might prevent the protein from interacting with small G proteins, as presented by Colla et al17 in AML or blast crisis of CML. By using dasatinib, which has previously been shown to be efficient in the blast crisis of CML,18 that has a clinical evolution similar to that of AML and is accompanied by cytopenias, we present for the first time a case that we consider to have a negative prognosis (BCR–ABL transcripts and cytopenias of unknown significance) and that is treated successfully and creates a bridge toward stem cell transplantation. Such clinical cases may be aggressive at presentation, but using modern combination chemotherapy with small molecule-based therapy and cellular therapies, the patient outcome might be improved. Still, we should emphasize that this manuscript is a case report and should be considered as such with all its limitations. Systematic recordings and long-term follow-ups are required to confirm our results. We deeply acknowledge the contribution of Laura-Ancuta Pop, Bobe Petrushev, Mariana Patiu, Sonia Selicean, Grigore-Aristide Gafencu, Wilhelm-Thomas Micu, Daiana Temian, Ancuta Jurj and Ioana Berindan-Neagoe. Ana-Maria Rosu received funding from an internal grant of the Iuliu Hatieganu University, awarded to Ph.D. students. Ciprian Tomuleasa received funding from the Romanian Research Ministry, contracts PN-II-RU-TE-2014-4-1783 (awarded to young research teams) and CNFIS-FDI-2017-1350 (awarded to institutional development funds), as well as from an international collaboration grant between Romania and People’s Republic of China, contract 57 BM/2016. The authors report no other conflicts of interest in this work. Giri S, Pathak R, Prouet P, Li B, Martin MG. Acute megakaryocytic leukemia is associated with worse outcomes than other types of acute myeloid leukemia. Blood. 2014;124(25):3833–3834. Ishiyama K, Yamaguchi T, Eto T, et al. Acute megakaryoblastic leukemia, unlike acute erythroid leukemia, predicts an unfavorable outcome after allogeneic HSCT. Leuk Res. 2016;47:47–53. Arber DA, Orazi A, Hasserjian R, et al. The 2016 revision to the World Health Organization classification of myeloid neoplasms and acute leukemia. Blood. 2016;127(20):2391–2405. Von Boros J, Korenyi A. Uber einen fall von akuter megakaryocyblasten-leukamie, zugleich einige bemerkungen zum problem der akuten leukemie. Z Klin Med. 1931;118:679–718. Bennett JM, Catovsky D, Daniel MT, et al. Criteria for the diagnosis of acute leukemia of megakaryocyte lineage (M7). A report of the French-American-British Cooperative Group. Ann Intern Med. 1985;103(3):460–462. Oki Y, Kantarjian HM, Zhou X, et al. Adult acute megakaryocytic leukemia: an analysis of 37 patients treated at M.D. Anderson Cancer Center. Blood. 2006;107(3):880–884. Corm S, Renneville A, Rad-Quesnel E, Grardel N, Preudhomme C, Quesnel B. Successful treatment of imatinib-resistant acute megakaryoblastic leukemia with e6a2 BCR/ABL: use of dasatinib and reduced-conditioning stem-cell transplantation. Leukemia. 2007;21(11):2376–2377. Pastore D, Specchia G, Carluccio P, et al. FLAG-IDA in the treatment of refractory/relapsed acute myeloid leukemia: single-center experience. Ann Hematol. 2003;82(4):231–235. Jackson GH. Use of fludarabine in the treatment of acute myeloid leukemia. Hematol J. 2004;5(suppl 1):S62–S67. Delia M, Pastore D, Carluccio P, et al. FLAG-Ida regimen as bridge therapy to allotransplantation in refractory/relapsed acute myeloid leukemia patients. Clin Lymphoma Myeloma Leuk. 2017;S2152–S2650(17):30285–30289. Tallman MS, Neuberg D, Bennett JM, et al. Acute megakaryocytic leukemia: the Eastern Cooperative Oncology Group experience. Blood. 2000;96(7):2405–2411. Gassmann W, Löffler H. Acute megakaryoblastic leukemia. Leuk Lymphoma. 1995;18(suppl 1):69–73. Pagano L, Pulsoni A, Vignetti M, et al; GIMEMA. Acute megakaryoblastic leukemia: experience of GIMEMA trials. Leukemia. 2002;16(9):1622–1626. Duchayne E, Fenneteau O, Pages MP, et al. Acute megakaryoblastic leukaemia: a national clinical and biological study of 53 adult and childhood cases by the Groupe Français d’Hématologie Cellulaire (GFHC). Leuk Lymphoma. 2003;44(1):49–58. Cheson BD, Bennett JM, Kopecky KJ, et al; International Working Group for Diagnosis, Standardization of Response Criteria, Treatment Outcomes, and Reporting Standards for Therapeutic Trials in Acute Myeloid Leukemia. Revised recommendations of the international working group for diagnosis, standardization of response criteria, treatment outcomes, and reporting standards for therapeutic trials in acute myeloid leukemia. J Clin Oncol. 2003;21(24):4642–4649. Colla S, Sammarelli G, Voltolini S, Crugnola M, Sebastio P, Giuliani N. e6a2 BCR-ABL transcript in chronic myeloid leukemia: is it associated with aggressive disease? Haematologica. 2004;89(5):611–613. Cortes J, Rousselot P, Kim DW, et al. Dasatinib induces complete hematologic and cytogenetic responses in patients with imatinib-resistant or -intolerant chronic myeloid leukemia in blast crisis. Blood. 2007;109(8):3207–3213.